“Dignity and freedom are more precious than food.” This is the belief that arms our Palestinian political prisoners and strengthens their determination against Israeli jailers. The revolution of hunger strikes inside Israeli jails continues. Palestinian icon Khader Adnan’s hunger strike against administrative detention lasted for 66 days and ended with victory. This awakened our heroes’ pride to continue what Khader Adnan started and put an end to indefinite internment without charge or trial. Waves of individual hunger strikers have joined the battle since then, including Hana Shalabi, Thaer Halahlah, Bilal Diab, and Mahmoud Sarsak. The victories these former administrative detainees won freed them from Israel’s hands and inspired more to carry on the fight. Currently, four other administrative detainees are on hunger strike: Hassan Safadi, Samer Al-Barq, Ayman Sharawna, and Samer Al-Eisawy. Each has his own story of bitterness and poise. The other evening, I went with a group of friends and relatives to the beach to escape the power cuts at our houses. I planned to enjoy the sunset and breathe fresh air while chatting about my sister’s wedding in a month. Instead, I found myself saying how ashamed I felt for getting preoccupied with studies during my exams and not blogging about the hunger strikers. That started an endless, emotional conversation about them. It was very late when we realized that we had been so absorbed by the conversation that we missed the sunset. “Why haven’t Samer Al-Barq and Hassan Safadi reached any victories yet, even after their hunger strikes broke records?” we wondered. Who should we blame for the critical condition they face? Should we blame Palestinian leaders, for whom the issue seems unimportant? Or those politicians who trade with Palestinians’ lives? Or divided factions who care for their own gains more than the public interest? Or the popular movement inside Palestine that is not doing enough? Or the deteriorating economic situation that chokes people in Palestine and pushes them to burn themselves like Ehab Abu Nada? Or the international community and human rights organizations who stay silent while watching these crimes against humanity in Palestine, either in Israel’s jails, in the Gaza Strip’s open-air prison, or in the occupied West Bank? I feel confused. I can excuse my oppressed people, for their priorities have reversed. They also face slow death under Israel’s stifling apartheid regime. All they care about is surviving each day. They don’t dare to have future plans because they don’t want to be wishful in a place unsettled politically, economically, and socially. But what about free people around the world? Our hunger strikers are freedom fighters, struggling for justice, for humanity. Why turn your backs on them? When I returned home from the beach, I phoned Samer’s family in Jayyous, a small village near Qalqilya. My hands shook when I spoke to his father. I thought he would appreciate a call from Gaza. He did, but in my heart, I felt useless and ashamed that my call came late, as he is expecting to hear the news of his son’s death any moment. I knew, though, that my words would be useless. I tried to pull myself together and not to cry as I told him, “I pray you strength, and that you will hug your son alive and victorious soon, inshAllah,” but I wasn’t strong enough to control my shaking voice. Every minute, if not second, can make a difference in Samer’s life now. He began a hunger strike two days before the mass strike started on Prisoners’ Day, April 17, to protest his administrative detention. An end to administrative detention was one of the mass hunger strike’s demands. In exchange for its end, an agreement was reached on May 14 between the Israeli Prison Service and the higher committee of the hunger strike, with Egyptian mediation, to meet our detainees’ demands. Accordingly, Samer ended his strike. But a week after the 28-day mass hunger strike ended, he discovered that his administrative detention order had been renewed. That pushed him to resume his hunger strike to protest this violation of the agreement. His renewed hunger strike has lasted 110 days. “Nothing at all was found against him?” I interrupted. Samer’s time in detention was very tough. He spent three years of isolation in Jordanian jails. When he was arrested by Israel, he endured even more brutality, especially during his hunger strike. Trying to pressure him to end his strike, the IPS transferred him to Ramla Hospital Prison, or the “slaughterhouse,” as many ex-detainees describe it when recalling the medical neglect, humiliation and discrimination they endured there. The IPS pressured Samer and his comrade Hassan Safadi to end their hunger strike using various methods. They were put in a narrow isolation cell, with barely any space for their shared wheelchair, and shackled them to their hospital beds, even though they could barely move. Even worse, they were physically attacked by jailers whenever they protested against their terrible conditions in Ramla. On August 13, Hassan’s head was slammed against the iron door of his cell twice, causing him to fall to the ground, unconscious. Prison guards then dragged him through the hall, past all the other prisoners. 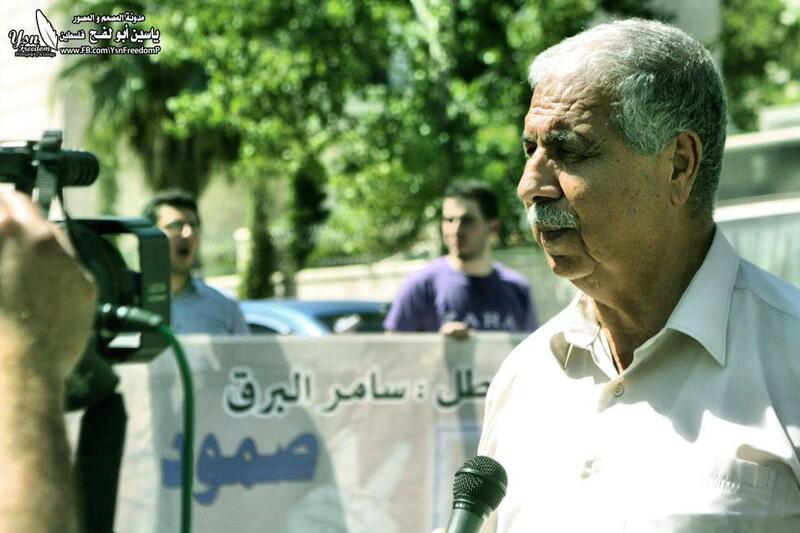 Yesterday, Samer’s father protested at the Egyptian embassy in Ramallah to ask it to receive Samer in Egypt. At the end of the call, I asked his father to tell me what he wished to tell the world. 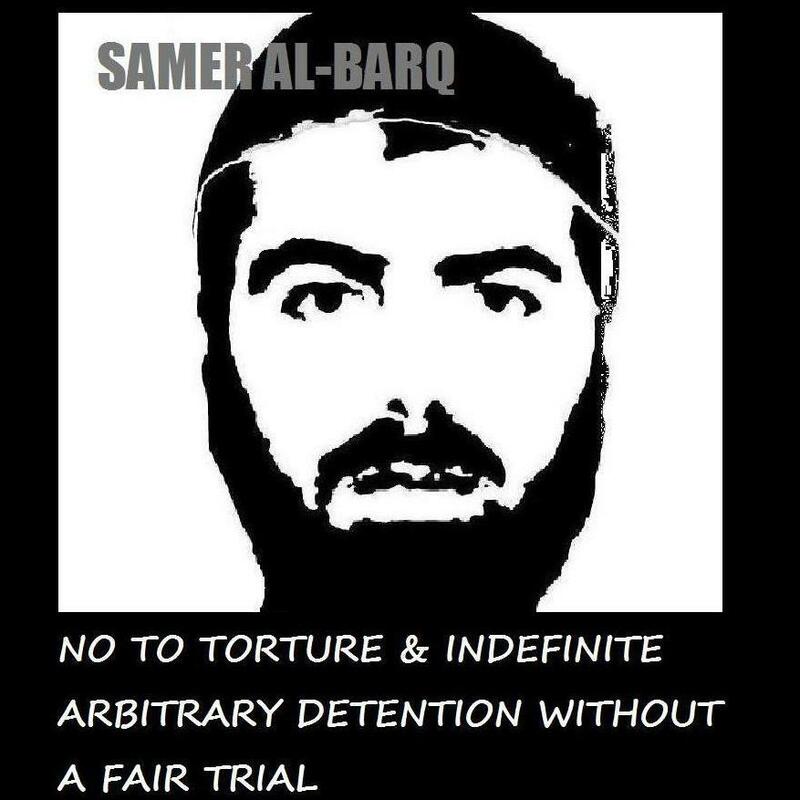 He replied, passionately and quickly, “His hearing is on Sunday, September 9, and no one knows if the court will decide in Samer’s favor or against him. Besides, I don’t even think that Samer can wait for days. He’s motionless on his hospital bed suffering gravely,” he said.